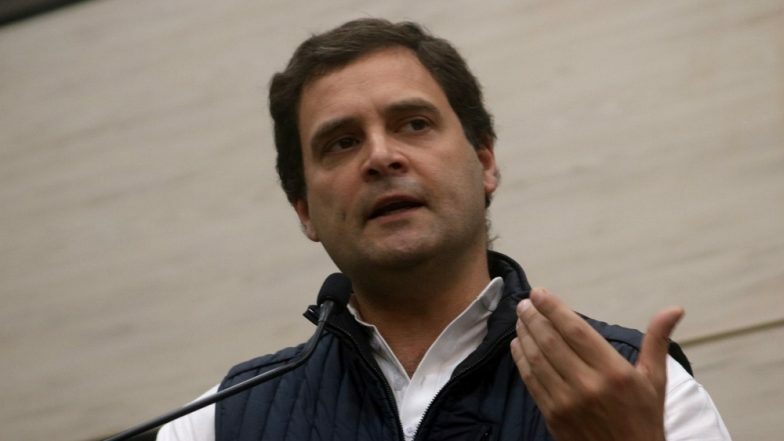 New Delhi, April 11: Reacting to reports of alleged threat to Congress President Rahul Gandhi's life, the Ministry of Home Affairs on Thursday said the green laser light aimed at him was originated from the mobile phone of Congress party's photographer. The MHA also said it didn't receive any letter from the Congress party regarding security breach of Rahul Gandhi. "We've not received any letter regarding alleged breach in security of Congress President Rahul Gandhi," the ministry said. "Director SPG informed MHA that the “green light” shown in clipping was found to be that of a mobile phone used by AICC photographer, who was video graphing the impromptu press interaction of Rahul Gandhi near the collectorate in Amethi," it added. The Congress party wrote a letter to Union Home Minister Rajnath Singh alleging death threat to Gandhi. It alleged that Gandhi's security cover was breached when he was interacting with the media after filing his nominations paper from Amethi Lok Sabha seat in Uttar Pradesh on Wednesday. A green laser was pointed 7 times at Gandhi’s head, it added. "A laser (green) was pointed at his head, intermittently on at least 7 separate occasions in a short period; including twice at his temple on the right side of the head," the party said in its letter. "A perusal of the video by various persons including former security personnel leads to a prima facie conclusion that this laser could emanate from a potential weapon such as a sniper gun," it added. Rahul Gandhi Promises to 'Scrap NITI Aayog', Reinstitute Planning Commission if Congress Voted to Power. Citing assassination of Rahul’s father and grandmother, former prime ministers Rajiv Gandhi and Indira Gandhi, the Congress asserted that the security breach was “a cause of grave and pressing concern” and asked the ministry to ensure that the protocol relating Rahul Gandhi’s security detail is strictly followed.